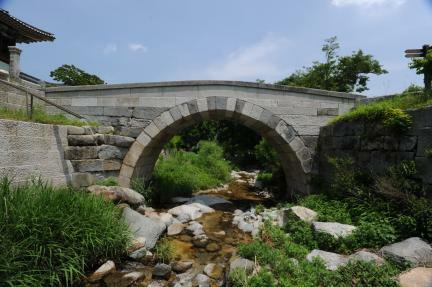 고성 건봉사의 대웅전 지역과 극락전 지역을 연결하고 있는 무지개 모양의 다리로, 규모는 폭 3m, 길이 14.3m, 다리 중앙부의 높이는 5.4m이다. 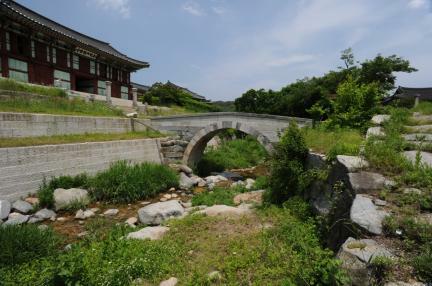 사적기에 따르면 건봉사는 신라 법흥왕 7년(서기 520년)에 아도 스님에 의해 원각사(圓覺寺)라는 이름으로 창건되었다. 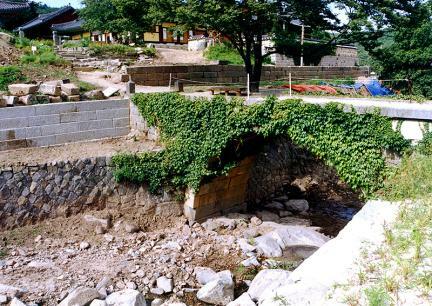 이후 신라 말 도선 국사가 중수한 뒤 절의 서쪽에 봉황새 모양의 돌이 있다고 하여 서봉사(西鳳寺)라 하였으며, 고려 공민왕 7년(1358년)에는 나옹 스님이 중수하면서 다시 건봉사라 이름하였다. 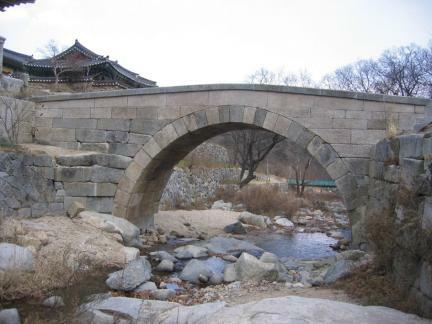 다리의 중앙부분에 무지개 모양의 홍예를 틀고 그 좌우에는 장대석으로 쌓아서 다리를 구성하였는데, 홍예는 하부 지름이 7.8m이고 높이는 기석의 하단에서 4.5m이므로, 실제 높이는 조금 더 높다. 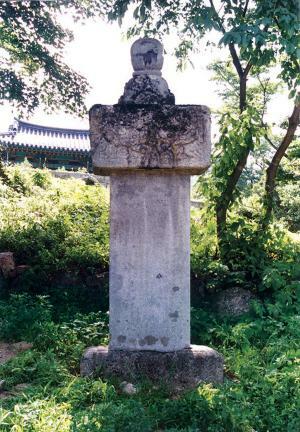 조선 숙종 34년(1708)에 건립된 경내 불이문 옆의 ＇능파교신창기비(凌波橋新創記碑)＇에 의하면 이 다리가 숙종 30년(1704)부터 숙종 33년(1707)사이에 처음 축조되었다는 것을 알 수 있다. 그 후 영조 21년(1745)에 대홍수로 붕괴되어 영조 25년(1749)에 중수하였고, 고종 17년(1880)에 다시 무너져 그 석재를 대웅전의 돌층계와 산영루(山映樓)를 고쳐 쌓는데에 이용하기도 하였다. 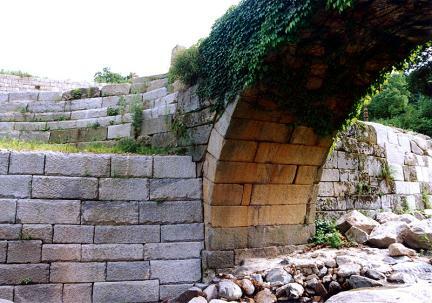 규모가 비교적 크고 원형이 잘 보존되어 있는 다리로, 축조연대와 건립자 등을 알려주는 비석을 갖추고 있어 홍예교 연구에 좋은 자료가 되고 있다. 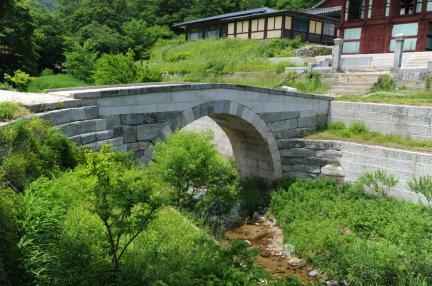 This is an arch bridge linking the Main Hall area and Amitabha Buddha Hall of Geonbongsa Temple, Goseong (width: 3m; length: 14.3m; height of the center: 5.4m). 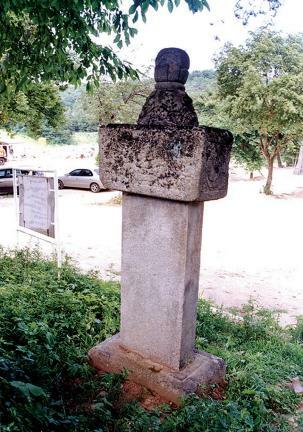 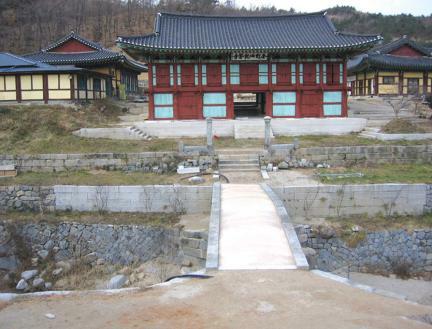 According to the relevant records, Geonbongsa Temple was founded and christened Wongaksa by Monk Ado in 520 (the 7th year of the reign of King Beopheung of Silla). 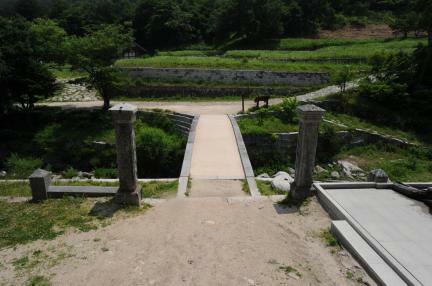 It was renovated by State Preceptor Doseon toward the end of Silla (57 BC- 935 AD) and renamed Seobongsa in association with the existence of a phoenix-shaped stone in the western section of the temple. 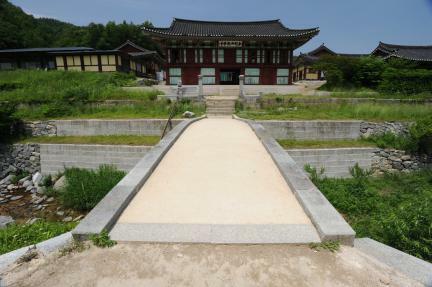 It was renovated again in 1358 (the 7th year of the reign of King Gongmin of Goryeo) by Monk Naong and renamed Geonbongsa. 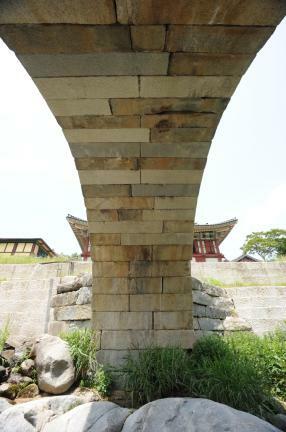 The arch at the center has diameter of 7.8m and height of 4.5m. 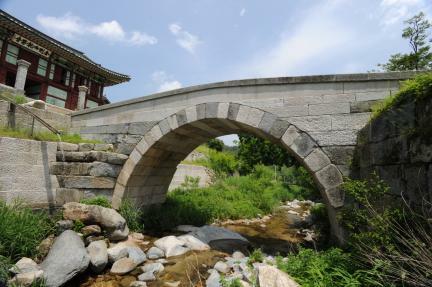 The stone monument within the temple set up in 1708 (the 34th year of King Sukjong’s reign) to commemorate the construction of the bridge tells us that the bridge was first built between 1704 (the 30th year of King Sukjong’s reign) and 1707. 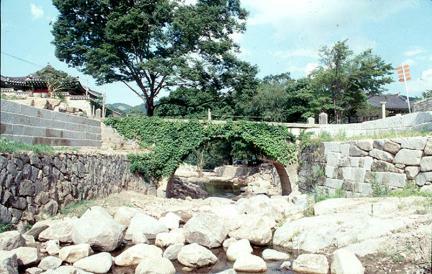 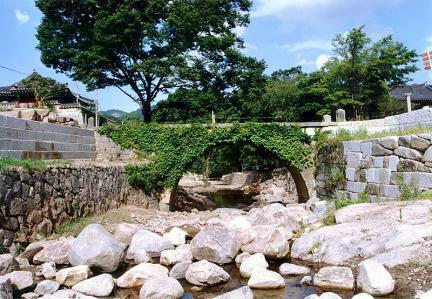 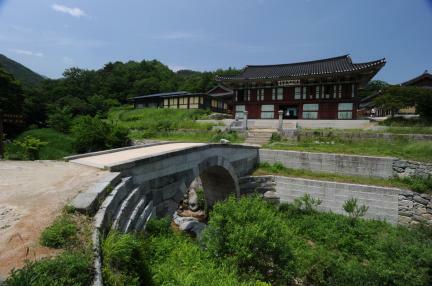 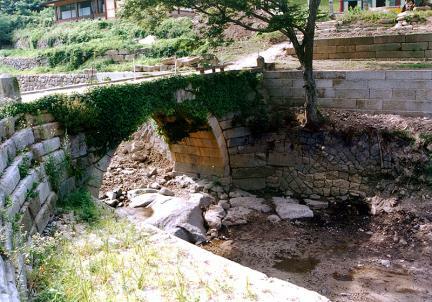 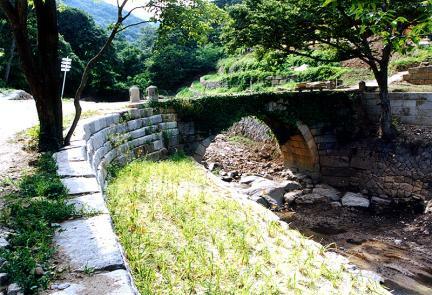 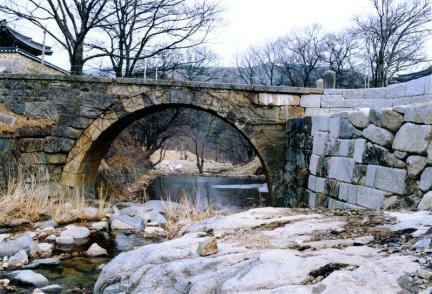 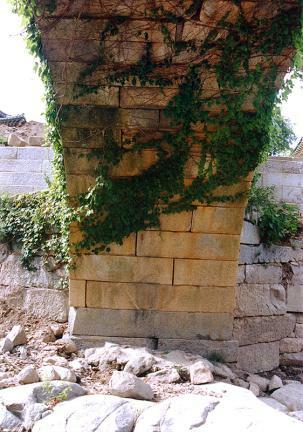 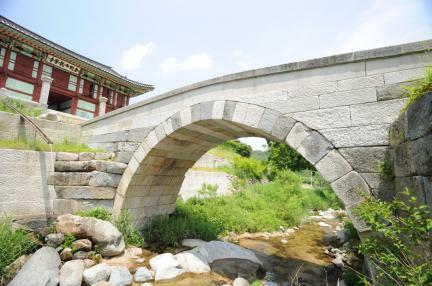 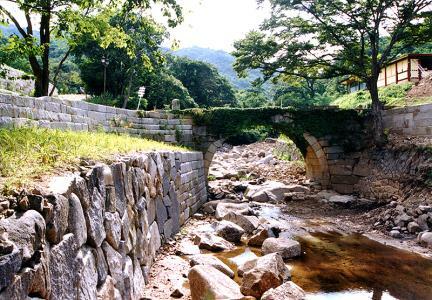 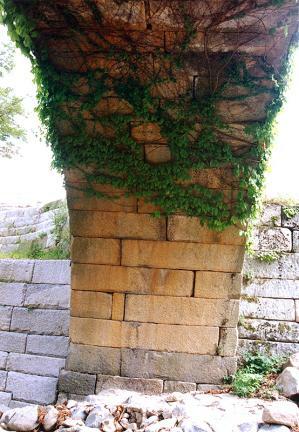 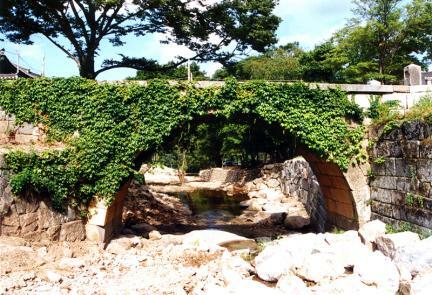 The bridge was renovated in 1749 (the 25th year of King Yeongjo’s reign) after it collapsed due to flood, only to collapse again in 1880 (the 17th year of King Gojong’s reign). 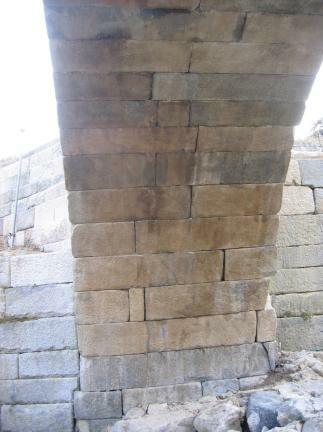 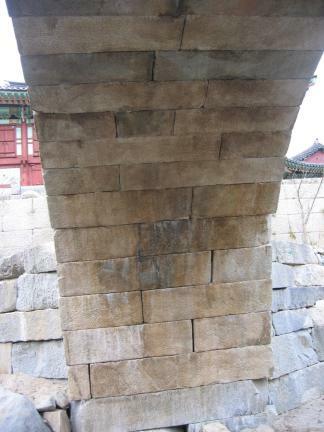 The stones of the collapsed bridge were used to repair the stone stairs of the Main Hall and Sanyeongru Pavilion. 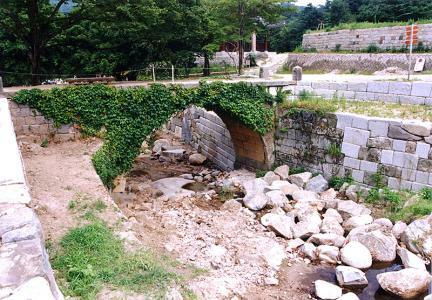 The bridge has maintained its original shape relatively well, and there is a stone monument containing information on when it was first built and who built it.